MADISON, Wisc. 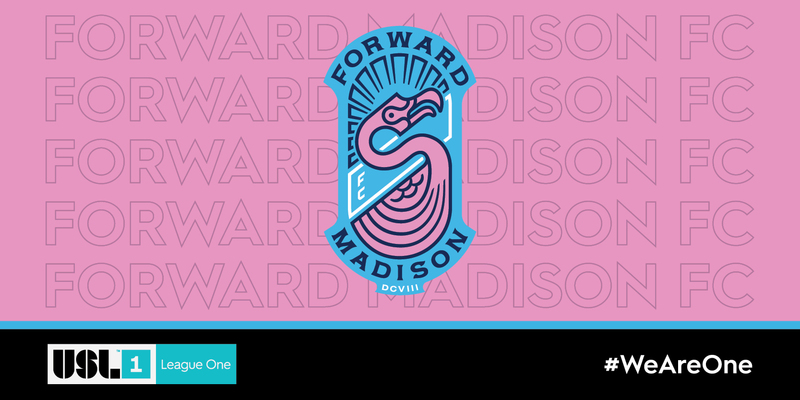 – Forward Madison F.C., Madison’s first professional soccer team, announced its team name, logo and colors at an event at the Wisconsin State Historical Society this afternoon. The team branding was introduced by team owner Jim Kacmarcik, Managing Partners Vern Stenman and Conor Caloia, and Managing Director Peter Wilt. “Kudos to Madison soccer fans for submitting the name Forward and voting for it above all the other submissions. This was the most popular name submitted in the crowdsourcing efforts and received the most votes throughout the process. Incorporating the state motto ‘Forward’ is appropriate as it reflects the team’s continuous drive to be a national leader,” said Wilt. “We also incorporated the Official Bird of Madison, the Pink Plastic Flamingo, which was also a popular name submission by the fans,” Wilt said. The history of Madison's connection to the plastic bird goes back nearly 40 years. University of Wisconsin student government leaders Leon Varjian and Jim Mallon took artist Don Featherstone's 1957 plastic icon and on the first day of classes in 1979, made Madison history. That's when, as a prank, they placed more than a thousand pink flamingos on Bascom Hill. “Their genius, creativity, whimsy and independence reminds us that life – and soccer, especially in Madison – should be fun and a bit irreverent,” said Wilt. Madison agency Planet Propaganda’s design team created the logo, which incorporates several local representative elements. “Planet Propaganda did a great job distilling the spirit of Madison into this brand,” Wilt said. The logo has representation of Madison’s Isthmus with the sash and area code in Roman numerals, while the blue color represents the lakes that influence so much of Madison life. Fans can find season ticket and merchandise information on the team website: www.forwardmadisonfc.com.